Washington, DC — In its recent compilation of Top Doctors from across the country, U.S. News & World Report has chosen Dr. Mark Richards as one of the top plastic surgeons in the nation for his years of dedicated service and quality results. The list is released annually and features more than 31,000 physicians in a wide range of medical specialties. The U.S. News & World Report Top Doctors directory is designed as a resource for patients looking for reputable and trustworthy medical professionals specializing in everything from pediatrics and cardiology to plastic surgery in Washington, DC. Aided by the research company Castle Connolly, doctors are selected through a peer-nomination process and then reviewed by a physician-led team to determine the final list. Additionally, according to the rules of the U.S. News & World Report Top Doctors compilation, no doctor can nominate themselves or pay to be included in the directory. Whether he is performing a facelift or advising his patients on the benefits of hormone replacement therapy, Dr. Richards says his first priority has always been to treat each patient with compassionate care and the most effective techniques. Dr. Richards stated he was grateful to be included in the U.S. News & World Report Top Doctors list, and looks forward to continuing to provide his patients with the individualized quality treatment they deserve. Regardless of a patient’s medical concerns, directories like Top Doctors can offer a useful guide for patients looking for a procedure; however, the Washington, DC plastic surgeon encourages patients to also conduct their own research in order to ensure they find a doctor that is specialized for their needs and board-certified by a medical board recognized by the Accreditation Council for Graduate Medical Education. Dr. Mark Richards graduated from Yale University and the University of Maryland School of Medicine, after which he completed five years of general surgery residency training and two years of residency in plastic surgery. Board-certified by both the American Board of Surgery and the American Board of Plastic Surgery, he has been featured in the Consumer’s Research Council Guide to America’s Top Surgeons since 2002. 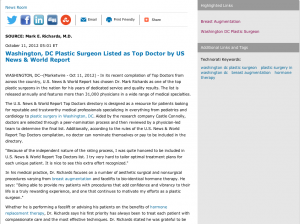 Dr. Richards has been selected by numerous agencies and publications, (including The Washingtonian) as one of the Best Cosmetic Surgeons in the U.S., and has published several articles in top medical publications such as the Aesthetic Surgery Journal. He lectures internationally on various topics.